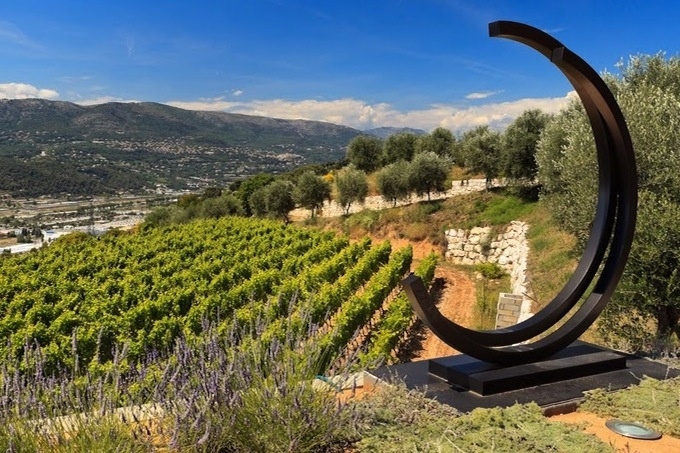 Head to the hills for the Portes Ouvertes de Bellet this coming weekend. It’s time to become acquainted with your local wine! Do you know about Nice wine? Of course, most wine is nice, but I’m referring more specifically to the wine produced here, in Nice. Ten vineyards make up the AOC Bellet, found hidden in the hills of the city. Officially recognised as an Appellation d’Origine Contrôlée (AOC) in 1941, Bellet is one of France’s smallest AOC’s and the only one found entirely within city limits. Trivia bound to impress! There’s much to like about Bellet wine. For starters, the majority of vineyards are family owned and operated. Production is small, little more than 50 hectares of vines are planted, translating to less than two hundred thousand bottles annually. The setting is picturesque, with sweeping views from the mountains, through the Baou of Saint-Jeannet, down to the Mediterranean. Historically the wines have graced the tables of monarchs and presidents, so with a glass of Bellet you’re in good company. Yet with sporadic opening hours and costly tastings (on average €10 per person) an excursion to Bellet rarely appears on most visitors’ radar. Which is why the ‘Portes Ouvertes’ are a perfect opportunity to get tasting, as doors will be opened and corks will be popped, all free of charge! What should you expect from a Bellet wine? The main white variety is Rolle, widely planted along the coast into Provence. You may be more familiar with its Italian name, Vermentino. In Bellet, a small percentage of Chardonnay in the blend is not uncommon. The wines make perfect summer drinking. Many Bellet rosés are made entirely from Braquet, a red grape indigenous to Bellet. Braquet produces a darker rosé than its Provence counterparts (usually a blend of Grenache, Syrah and Mourvèdre), but don’t judge a rosé by its colour, as you’ll be pleasantly surprised with the crisp, refreshing style it produces. Bellet reds are usually a blend. Count on finding a large percentage of Folle Noire, another variety found only in these hills, along with Braquet, Grenache and occasionally Cinsault. Of course, the wines of Bellet are a great match with Niçoise cuisine! So what’s happening for the Portes Ouvertes? Each of the 10 Bellet vineyards will welcome visitors between 10am and 6pm on both days. Expect to taste 2012 vintage whites and rosés, many freshly bottled! The reds will be a year or two older. At Domaine de Toasc, one of the most respected producers, all of their wines will be available to taste. The property itself is worth the visit as the Nicoletti family is dedicated to supporting local artists and is home to many artworks. Don’t miss Château de Bellet. Set amongst a beautiful estate (currently undergoing renovations, sadly), their wines are widely regarded as the best in Bellet. The de Charnacé family is a Bellet stalwart and credited with guiding the appellation through some challenging times. If all this tasting is making you peckish then head to Domaine de la Source, where an innovative Niçois family are making organic wines. Wood fired socca and pissaladière will be served. This is just a selection of what’s on offer. Nominate a driver, since public transport access is limited and the distance between each vineyard is too great to walk. Plus, this way you won’t have to carry your purchases home! The Portes Ouvertes only happen twice a year; the next in December. If you can’t make the open days, but still want your fix of Nice wine, head to La Cave de la Tour in Vieux Nice. Listing almost every wine from the 06 region, settle in for an armchair lesson in the wines of Bellet! For more details, visit the Vins de Bellet website. Learn Italian the Italy-Amo Way!